New Years Eve is not just a day of partying with your friends and family, but a day of reflection. I have spent a lot of time thinking about everything I have accomplished in 2012 and wanted to highlight a few. and that isn't even half of my favorite moments! 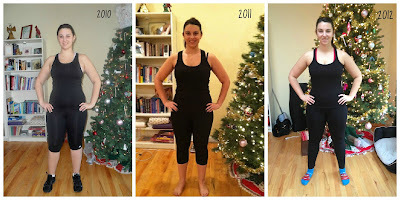 On 12-31-11 I posted a body comparison from 2010-2011. It's my own way to visually see the changes my body is making even if I don't feel them. The biggest change is from 2010 to 2012 but I can see a lot of differences between last years photo and this year. My waist is considerably smaller this year and my hips. The area around my bra/chest continues to be my biggest trouble area and this year it is my goal to banish all of that extra flub. No one wants that hanging over their wedding dress! Overall I am happy with how far I have come but I see there is still a long way to go. I will be increasing my ST this year in addition to 1/2 marathon training and continuing my yoga practice. Great Job I admire your perseverance . You've come a long way lady! Great job! What a GREAT idea! I will be taking my pictures for this coming year ASAP! You can really see the difference and what a great job you did over the past couple years. Best wishes for you in the New Year! 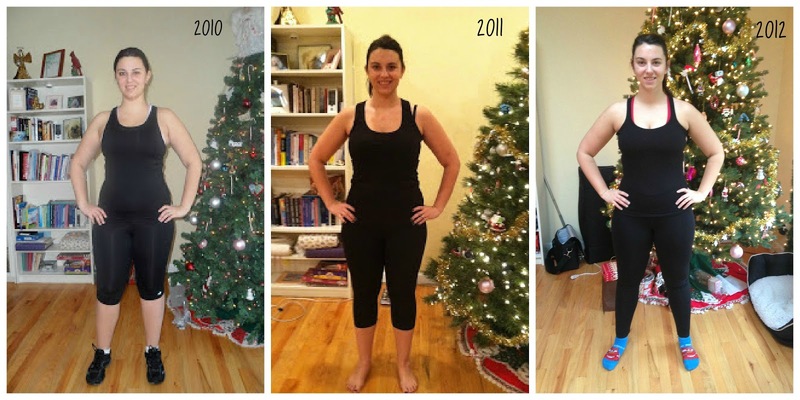 Awesome progress & an even more awesome attitude for what you will do in 2013. Setting your mind to it will make you succeed. And I see a huge difference in how toned you are in the pics! Happy New Year lady! Great. Job! A lot of accomplishments! Hunnie, you have come such a long way. You look great =) Keep doing what your doing, bc it's working! Great job girl, you look great! Very noticeable changes. Stick with it!